We observed the process of removing the leaves of “Sun Tsugaru” on August 27, 2016. 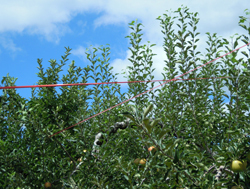 The removing of leaves is for the coloring of apples, exposing the fruit to more sunlight. 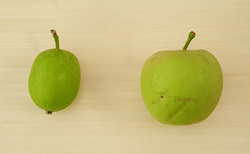 But excess thinning causes a malnutrition of the fruit, owing to less photosynthesis. The farmers were skillfully thinning leaves one after another. 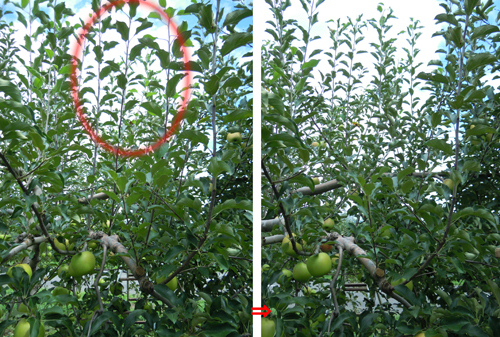 At the same time, they clipped the spindly growth of apple tree branches. Some shoots were longer than our height. The sunlight is essential for apples to become red, but there is another condition for this coloring to occur. It’s temperature. The apples start to color when the lowest temperature of the day is below 20 degrees C, even when the temperature is high during the daytime. Regarding the coloring, please visit here. A few days after the removal of leaves, rotating of fruit is performed so that all surfaces of the fruit gets red. The process of coloring after the removal of leaves and rotating of fruit happens days later. When apples get bigger, there occurs feeding damage by crows. 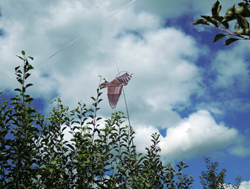 To cope with them, the farmers were using a model hawk which was flying in the air (the photo on the left). It looked like a real one. There was sparkling tape (the photo on the right) as well, but the model hawk is the most effective, they said. 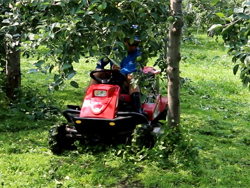 We’d like to introduce you to the mowing scene: care for the whole apple orchard. The farmers grow weeds to prevent moisture loss in the ground, soil erosion and to supply organic substances. *Soil erosion means the washing away of soil by the flow of rainwater and wind, thus wasting the land. *A supply of organic substances means the supply of necessary nutrition to grow apples properly. The leguminous plants will supply nitrogen to the soil and decomposed mowed grass becomes nutrients. When the grass grows too high, however, it absorbs the moisture and nutrients of the soil. Also, bugs and mice tend to inhabit tall grass fields. So, the grass has to be mowed 4 to 6 times a year. 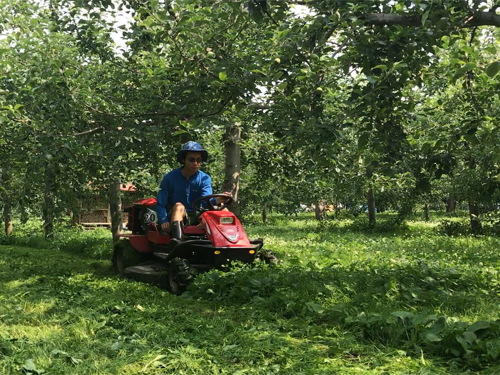 In this orchard, they were using a vehicle type mower, and riding it like a go-cart. It runs fast and it’s efficient for mowing a large area. But they need to be cautious not to collide with branches. They tried to cut to the edge of the tree trunks. They used a hand-held weed whacker for any parts they couldn’t mow, along with the work of thinning. This process should be done every time the grass grows. It takes many hours depending on the scale of the orchard. But it’s worth doing not only as a countermeasure for bugs and mice, but also for a neat and easy working atmosphere. In the case of a long spell of fine weather, some don’t cut the grass for a while to prevent evaporation of the soil. Others intentionally cut the grass higher. The method and timing of mowing are all different depending on each individual. There are reasons to allow weeds to grow. 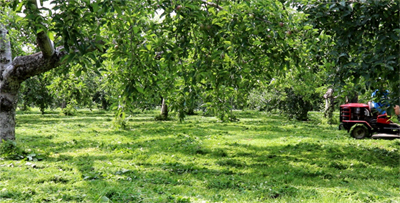 Mowing can reduce noxious insects and diseases while keeping the orchards clean. It is a critical process to produce delicious apples. 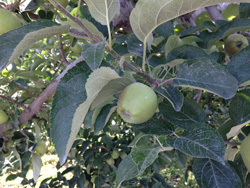 When we talk about apple cultivation, we tend to focus on fruit and trees. 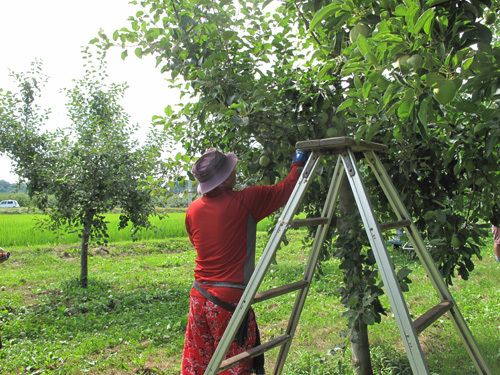 But mowing grass to care for the whole orchard is one of the important jobs as well. On July 21, 2016, we were at the growers for the final sorting-out. This is the process to select fruit again on the tree to see if they are growing properly or discard damaged ones. The un-pollinated dwarf fruit. The fruit with tough skin. In the previous sorting-out, the stems were left on the branch. It is because the branch gets weaker if the stem ispicked, causing the remaining apples to easily fall from the tree. “Jigajiga” usually fall automatically. The rest need to becleared. The photo on the right shows the damage caused by “jigajiga. The final sort-out is done by hand as well. 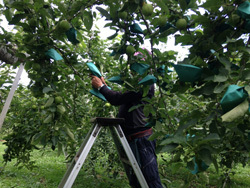 Since it is one of the important processes to encourage the fruit to grow, they look into the trees while sorting-out thoroughly and attentively during the hottest period of summer. We visited the growers to see the bagging of apples. After the sorting-out, they bag each fruit to protect them from diseases and pests, and to promote coloring and longer storage life as well. This bag contains various modifications, although it looks like a regular bag. 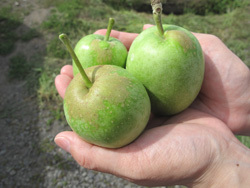 It has a slit to hook on the stem, and a wire is inserted to clip it onto the fruit. It is perforated for an easy removal. 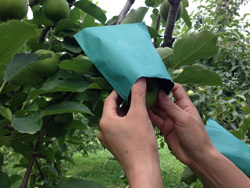 The bagging is always done by hand, and a skilled worker can bag 1000 apples per day. On the other hand, there are apples cultivated without bagging. 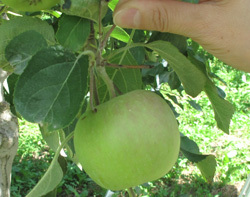 They receive more sunshine to become sweeter apples, but they are lacking in color and storage life compared with the bagged ones. For the features of bagged and un-bagged apples, click here. 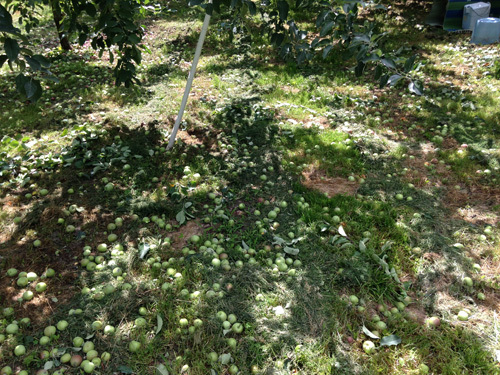 We visited an apple grower to observe the sorting-out work on July 5, ’16. 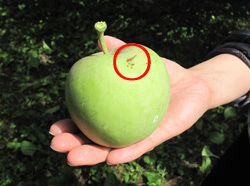 This is done to grow bigger and more delicious apples by removing irregular fruit from the tree. We were permitted to experience some of this process in the orchard, but of course we were far behind in speed. Note that they are deciding which fruit to pick in an instant. Furthermore, during sorting-out they remove only the fruit, leaving the stem behind. The skilled growers perfectly determine the fruit to be saved and carefully leave the stem, all within just a moment. he operation doesn’t end here. When the fruit get big enough, they proceed to the final sorting-out. 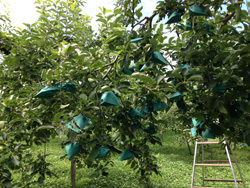 And bagging, removing leaves, and fruit-rotating follow in the course of farming. 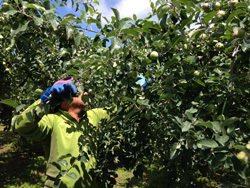 Apples in Aomori are grown to be bigger and more delicious by the special care given by these skillful farmers.